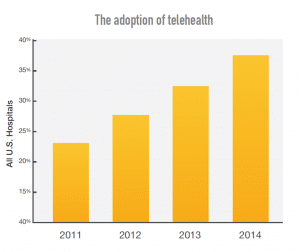 Interest in telehealth continues to rise in U.S. healthcare organizations. 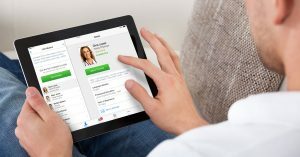 The August 2014 Healthcare Information and Management Systems (HIMSS) study on telemedicine adoption found a very favorable view of the U.S. telehealth market, and it’s predicted that in 2014 alone there will be 75 million e-visits in the U.S. and Canada. Healthcare systems know that clinical interactions don’t always need to be done in the same room and they are increasingly incorporating telehealth into their every day practices. Telehealth deployments run the gamut from acute treatment of minor illness, rashes, strains and infections, to more advanced specialty use cases such as cardiology, radiology, mental health, urology, and neurology. 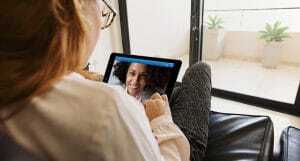 Most telehealth deployments aim to address gaps in care such as improving post discharge or post surgical follow-up, but we also see applications of telehealth that expand the geographic reach of specialists or reduce travel burden for home bound patients. As a result, early telehealth deployments look very different from each other depending on specific clinical initiatives, patient demographics, and location. ACOs recognize revenue from covered lives, and they keep more of that revenue by keeping their patient base healthy. Telehealth is a powerful tool to increase catchment area, acquire new patients, and provide more touch points to address gaps in care. ACOs see telehealth as a powerful tool to increase access to care and provide more convenient care. Not surprisingly, telehealth results in high patient satisfaction scores and has the potential to improve HCAHPS scores. 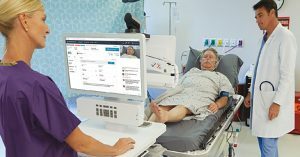 ACOs can use telehealth to protect profits from unreimbursed spend or penalties that can arise from overutilization of the ER or avoidable hospital readmissions. And they can use telehealth to compete with retail clinics, adding or retaining patients without incurring the capital cost of bricks and mortar. To read more, click here to download our eBook: Why ACOs Are Hot For Telehealth.